Disney Springs (formerly known as Downtown Disney) is doubling the number of shops and restaurants as a new concept, Disney Springs, emerges as a re-imagined version of this popular retail, entertainment and dining district. Located just outside of Walt Disney World’s theme parks in Lake Buena Vista, this multi-million redo of Downtown Disney promises to be a great experience. It is scheduled to be complete in the summer of 2016. A long time ago, there was this general store located next to a beautiful spring. One of its owners decided to make it into their home. Their family grew and so they continued to build rooms and out-buildings. The waterfront property became a sprawling complex and was then named The Boathouse; in a turn-of-the century lakeside town which became Disney Springs. A small Florida waterfront town which gradually, over time, became this retail, dining and entertainment district. Many restaurants and eclectic and contemporary shops are already open and being enjoyed by locals and tourists. There is something for everyone in the daytime as well as night. We’ll continue to update this page as new retailers are added and dining experiences open. Disney Springs is a fun thing to do in Orlando, and best of all, it’s free! You do not need a theme park ticket to visit Disney Springs. You will want to save up some spending money though. There are so many shops and eateries, it would be difficult to come here and not spend any money. Even so, the scenery will be true to Disney standards – when it is complete. Coming here just for the view would not be unheard of with a promenade so inviting guests can relax, refresh and reconnect. Retail shopping is great at Disney Springs. Many brands are well-known and are already located in the Central Florida shopping landscape. While there may be occasional discounts, do not expect huge bargains here. Think more along the lines of ‘exclusive.’ If you are looking for ‘cheap’ or ‘deep discounts,’ the Lake Buena Vista Factory Stores will suit your needs. From food trucks to expansive upscale restaurants, you can have your pick at Disney Springs. You can have your choice of location too. Care to dine outdoors? On a boat? How about on a rooftop? These choices and many more are offered at Disney Springs restaurants and bars. Even the establishments that have been here before the transformation from Downtown Disney to Disney Springs have been (or will be) updated with new dining features. Many themed restaurants will offer every type of food menu you can imagine, and many that you would never imagine! A wide range of entertainment is offered at Disney Springs. Most are located in the West Side and at The Landing. It is recommended to arrive at least one hour prior to any show/event you are wanting to attend. There is plenty to do to fill your wait-time. If staying at a Disney property, the best advice is to use their complimentary transportation. If staying elsewhere, getting to Disney Springs may be a bit of a hassle now, but very soon, it will be a much easier process. Two new walkways connecting Disney Springs guests from the Orange Garage to the West Side promenade are now open. Each walkway offers stairwells, escalators, and elevators. These connections are adjacent to Splitsville Luxury Lanes and near Planet Hollywood (soon to be called Planet Hollywood Observatory). Enter the walkways from the second level of the garage. The walkways are beautiful with lush landscaping, evidence of what the new Disney Springs will be like. Work continues on the parking lot of the Planet Hollywood complex, including a pedestrian bridge that now links across Buena Vista Drive. Buena Vista Drive is being widened to 10 lanes and an elevated ramp is now complete leading from I-4 that allows WDW visitors to exit and drive straight into the West Side parking garage (Orange Garage). This helps the traffic flow between Hotel Plaza Boulevard and the entrance to Typhoon Lagoon. Parking is also being expanded with other parking garages (and lots) which will raise the amount of parking to about a total of 6000 enclosed parking spots. This is roughly half the capacity of the Magic Kingdom’s parking lot! Parking is free and the new garages use smart technology to help drivers locate parking easier. Each level displays how many spaces are open with a green light indicating availability. Red lights indicate space is full. A blue light indicates handicap parking. Valet parking is also available at a flat rate of $20 per day (sales tax included, gratuity is not). While Disney Springs is under construction, expect some hassle and less than pristine views. 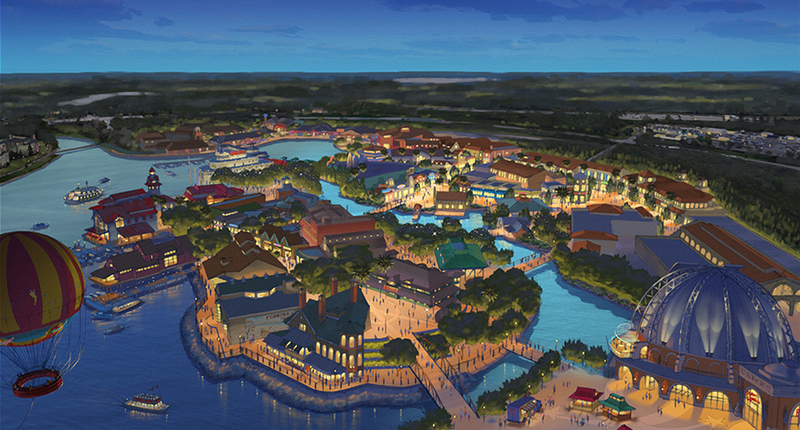 When complete, Disney Springs will be developed into four distinct, outdoor neighborhoods. These neighborhoods will include high-quality retailers and restaurants, as well as daytime and evening experiences, which will lure families, tourists and convention-guests with all that it offers – retail shopping, entertainment and a variety of dining experiences. The Town Center offers a sophisticated mix of shopping and dining along a promenade. Built with a Spanish-style architecture, you may think this is an old town restored from buildings erected by explorers that landed in Florida centuries ago. It is, however, a new and thriving Orlando experience. Without a distinct area designated within Disney Springs as The Town Center, this map showing all of the locations might come in handy. The Landing (formerly known as Pleasure Island) is one of four outdoor neighborhoods which make up Disney Springs. A perfect location for day and night, this area features an older look with rustic buildings that give you the feeling as if they’ve been around for decades. A flagship restaurant named The Boathouse offers steaks, seafood and many other delectable items. The upscale waterfront dining experience is not to be missed. Spring for a guided Amphicar ride which begins on land but enters the water for a 20-minute tour of Disney Springs. The Marketplace is the entryway for many Disney guests staying on the resort property. Buses to Disney Resort hotels drop off and pick up here. There is also a walkway to Hotel Plaza Boulevard at the Marketplace. Walk along the promenade or over the pedestrian walkway to get to The Landing and Town center. At the Marketplace you will find many restaurants and retailers. The West Side provides a lively atmosphere with entertainment with a more industrial feel. New seating areas provide an elevated platform that offer both shade and a view of the activity below. Come see a movie or go bowling. Enjoy a live performance at the House of Blues Music Hall or splurge and see La Nouba by Cirque du Soleil. There is something for everyone at the West Side. by the way, the new Exposition Park is located on the West Side – home to the Disney’s food trucks. If you ever visited Downtown Disney, you owe it to yourself to experience the new Disney Springs. You won’t recognize it! A beautiful shopping, dining and entertainment area that is a great addition to the Central Florida attraction landscape.